Give your Privia PX-150BK or PX-350BK keyboard a boost of height, plus a 3-pedal unit for damper, soft, and sustain. The Casio CS-67BK is a black wooden keyboard stand designed to support the Privia PX-150BK & PX-350BK digital pianos. 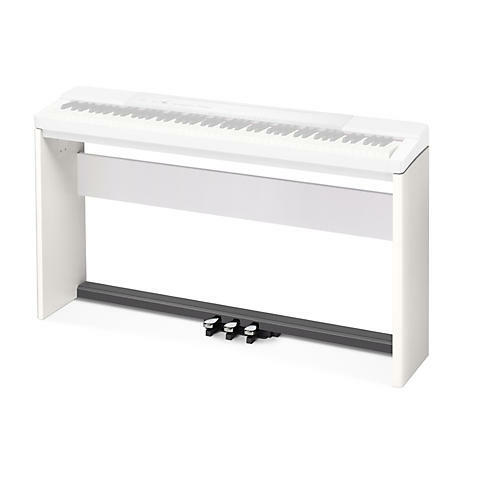 It provides a stable and secure platform for the piano, bringing it to an appropriate playing height. The SP-33 three pedal unit features damper, soft and sostenuto pedals all in a single unit that attaches to the CS-67BK stand. The SP-33 supports half-pedal operation, so effects can be partially applied if a pedal is partially pressed.